When teaching spellings while writing, getting learners to mentally group letters which represent a single sound and think of them as a single “chunk” (grapheme) can be tricky. This quickly shows you whether the learner understands which letters are working together to represent a single sound. Some phonics programs put a loop or arrow over the word rather than under it, to link the two vowel letters. Movable alphabets that incorporate multiple-letter spellings, such as my cheap-and-cheerful DIY 100-first-spellings Movable Alphabet, also help learners to conceptualise spellings as the building blocks of words. 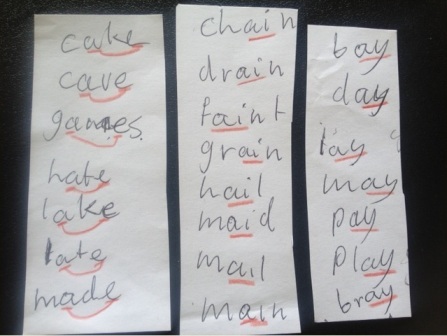 If you know of other simple tools or strategies which help learners conceptualise spellings as “chunks”, or resources to help with this which are not on my Phonics Resources list, I’d love to hear about them. This entry was posted in phonics activities, sound-letter links, sounds, spellings, teaching strategies on September 25, 2013 by alison.